Val d'Aran is located in the region of Catalonia in northern Spain. When the Roman’s occupied this area they built a road from Toulouse that ran through the valley. For many centuries the mountain passes between Val d’Aran and other Catalan regions were impassable in winter, until eventually the Vielha Tunnel opened in 1948. Because the valley is located on the Atlantic side of the Pyrenees it receives heavier snowfall than other parts of the Catalan Pyrenees. 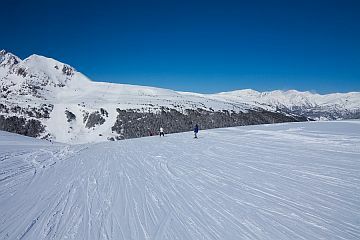 So many visitors come to the valley for its excellent skiing. In fact it has become one of the most fashionable places for winter sports since it became known the Spanish Royal family make regular visits. The Baqueira Beret Ski Resort has peaks that reach 2,500m and covers an area of almost 2,000 hectares so there is plenty of skiable terrain. It has 57 runs in total and they are divided into four levels of difficulty. Beret hosts many national and international competitions every year. As it also has a Nordic cross country ski trail that covers 7km, at the beginning of February is an international cross-country ski race known as the Marxa Beret. For the more adventurous there are many other snow-related sports that can be enjoyed such as heli-skiing, dog sledding, snowshoeing, and para-skiing. In the summer some of the chair lifts are kept open for ramblers and those who want to do some mountain hiking. Also in this area is the Aiguestortes i Estany de Sant Maurici National Park which is known for its crystal clear rivers and lakes, majestic waterfalls, and leafy forests. It you want a little cultural stimulation as well there are several delightful villages in the valley to explore. Vielha is not far and has a very rich heritage. This ancient town also has an interesting folk museum, an Ice Palace, and a centre where Caviar is produced. In the mountain village of Arties there is evidence of the Roman's presence by way of some well preserved Roman baths. It also has several buildings of other historical interest such as the 11th century Santa Maria Church with some outstanding paintings. The three main local feast days in this area and held during the summer. In June Arties celebrates the Feast of San Juan and in July they host the San Jaime Festival. Vielha has its own celebration with an interesting Cattle Fair which apparently should not to be missed. So whether you come for the skiing or hiking in the summer months, Val d’Aran has something for all the family and is located in a setting that is both tranquil and relaxing. One of the best places to stay while you are there is the Parador Arties which is a luxury four star mountain retreat in Val d’Aran. The Parador is built in the traditional mountain design and has a wonderful restaurant that specialises in regional dishes. The facilities include a swimming pool, sauna, and gym with a seasonal outdoor swimming pool. 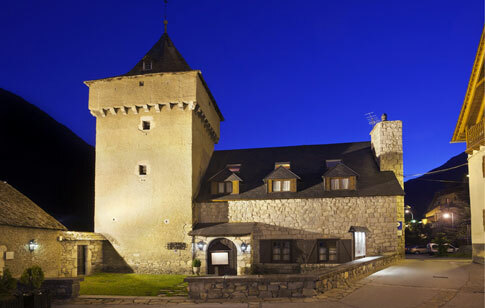 Parador Arties is also only 4.5 miles from the Baqueira Beret Ski Resort.